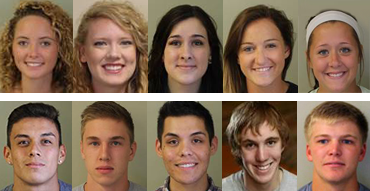 Five women and five men have been chosen as finalists for Homecoming queen and king at Cowley College. Crowning of this year’s queen and king will take place at halftime of the men’s basketball game vs. Coffeyville on Feb. 10. The men’s game begins at 7:30 p.m. The Homecoming Dance will follow in the Earle N. Wright Community Room. This year’s Homecoming theme is “Cowley Through the Ages”. Homecoming activities will run Feb. 7-10 and will consist of a Vintage Game Board Night, Cowley Jeopardy, Battle of the Decades & Minute to Win It, Tiger Iron Chef, Tiger Spirit Banner decorating contest, and Dorm Door decorating contest for bonus points. The winning group/organization will be awarded $100 and the annual Homecoming Sweepstakes trophy. Queen finalists are, Amy Austin, Morgan Hack, Logan Morrow, Maranda Oak, and Elizabeth Vishnefske. King finalists are, Bryce Fischer, Jonathan Lane, Mason Loewen, Arnoldo Ruiz, and Alex Salinas. Amy Austin, daughter of Mark and Nancy Austin, is a sociology major. At Cowley, she is involved in choir, Movie Club, and is president of the ACES organization. She plans to continue her education at a four-year university and then hopes to travel the world. Morgan Hack, daughter of Lynn and Tammy Hack, is a pre-medicine major. At Cowley, she is a student ambassador, resident assistant in the dorms, member of the Tigerette Danceline, and is involved in IMPACT and intramurals. She plans to transfer to the University of Kansas and then hopefully med-school. Logan Morrow, daughter of Brian and Jill Morrow, is a nursing major. At Cowley, she was named a Second Team All-Conference performer while helping the Lady Tiger volleyball team place sixth at the NJCAA Division II National Championships. She is also a member of the President’s Honor Roll and plans to continue playing volleyball at a four-year school. Maranda Oak, daughter of Jon and Tammy Oak, is a social work major. At Cowley, she is involved in CAAT and Phi Theta Kappa. She also serves as a student ambassador and was crowned Queen Alalah 84. She plans to attend a four-year university and eventually work with the underprivileged. Elizabeth Vishnefske, daughter of Mark and Patty Vishnefske, is a social work major. At Cowley, she is in Phi Theta Kappa, Act One Theatre Club, Creative Claws, Chi Alpha Youth Group, Sacred Heart Tigers, and was an Academic All-American as a member of the 2014 women’s soccer team. She is also a member of the President’s Honor Roll and was named the November 2015 Student of the Month. She plans to obtain bachelor’s and master’s degrees at a four-year school. Bryce Fischer, son of Steve and Kayla Fischer, is a business administration major. At Cowley, he is a member of the Tiger baseball team. He was named First Team All-Conference as a freshman and helped the Tigers finish with a school-record tying 54 wins. He has signed early to continue playing baseball at Oklahoma State University. Jonathan Lane, son of Bill and Joan Lane, is a Theatre major. At Cowley, he is involved in the Theatre Department. He plans to continue his education at a four-year school and eventually teach theatre while acting on the side. Mason Loewen, son of Reid Loewen and Caroline King, is a sports management major. At Cowley, he is a member of the Tiger men’s basketball team. He averaged 8.5 points per game as a freshman and is a valuable member of the team again as a sophomore. He plans to continue playing basketball at a four-year school with the hopes of playing professional basketball in the future. Arnoldo Ruiz, son of Arnoldo Ruiz Sr. and Leticia Sapien, is a social work major. At Cowley, he is involved in the CAAT program and the Phi Theta Kappa Honors Society. He plans to transfer to Kansas State University and pursue a master’s degree in clinical social work. His goal is to practice psychotherapy. Alex Salinas, son of Jesus and Lupita, is majoring in computer programming. At Cowley, he was a Second Team All-Conference selection while serving as the captain of the Tiger men’s soccer team. He is also involved in IMPACT and was named the school’s November Athlete of the Month. He plans to continue his education at a four-year school and hopes to one day become a professional soccer player and work as a computer programmer for Google.